Let’s face it: Flies are an infuriating bunch. It is a known fact. You can find them hovering over your food so they could perch on it. And if they do, it could be very problematic. Your health could be at risk. They have known vectors of more than sixty disease conditions. That should explain how dangerous flies are. Just like most problems we are faced with, there is a solution. Fly traps could catch these pesky insects preventing them from acting out their annoying behavioral pattern around your home. Fly traps work on what attracts these insects the most, food! When they get into the traps to enjoy whatever is within, they can’t leave. These devices can catch thousands of these insects without any escape. The edible component of these traps is usually based on fruits or similar substances which are sweet. Often, other insects like bees and gnats make their way into the trap. Changes in the edible components of such traps could keep bees away. But finding the best fruit fly and gnat traps is no easy feat in a market populated by junk and overseen by individuals whose priority is to make a profit first. This review is a must read if you’re looking to purchase a fly trap of immense quality. Rescue is one of few companies which introduced the use of traps. The idea was to replace chemical spray which users were more familiar with. Rod Schneidmiller who founded the company was ridiculed when he went marketing since many believed it was absurd trapping insects when you could kill them. Fortunately, Rod never let that deter him in his pursuit of a greener approach to pest and fly control. Rescue’s disposable fly trap works on attracting the pesky insects towards the inner chamber of the trap. Edible substances which a fly find very appealing are used. Sucrose, the sweet disaccharide serves as the active ingredient. This proves efficient at getting the insects into the trap. One of the more notable attributes of this flycatcher is its environment-friendly nature. It doesn’t kill the flies using any offensive chemicals. Insects like bees which play important roles are saved from harm. You are expected to add water to the trap with the aim of drowning flies which get into the setup. Also, the water dissolves the substances which attract the flies. The smell produced by the dissolved elements is responsible for the willingness of these insects to get into the trap. You can hang the trap a good distance from your home and flies will not get close to your property. Another feature which makes this flycatcher trap desirable is the well-planned arrangement. It is clean, organized and keeps everything within. You can afford to relax around the location of the device without being irritated. It is that good. The only problem might be the odor generated due to the dead flies in the trap. If you reside in locations where a large number of flies are on a rampage of some sort, this might be the product for you. This trap can hold thousands of flies. The plastic bag used in making the trap is capable of supporting the quantity of water needed and with zero signs of rupturing. This flycatcher has an effective range of 20 feet. This should prove sufficient for flies which can get to your home. Disposing of the trap isn’t tricky. Just make sure it is well sealed and dump it in the trash. The attractants only become active when water is added. So, you don’t have to worry about its length of stay in a warehouse affecting the efficiency of the trap. Everything has been well thought-out with this product. When it rains, this flycatcher might get filled to the brim and begin to overflow leaving the product completely useless. For more than a hundred years, Victor has been a recognized brand name in the pest control industry, and Woodstream Corp is responsible for this achievement. The company located in Oakham, United Kingdom has interests in a wide array of categories with pest control accounting for just one of such. The design of the Victor fly trap is one which tickles the fancy of this group of insects. The shiny top with an aperture at the base has been shown to attract flies to the trap. 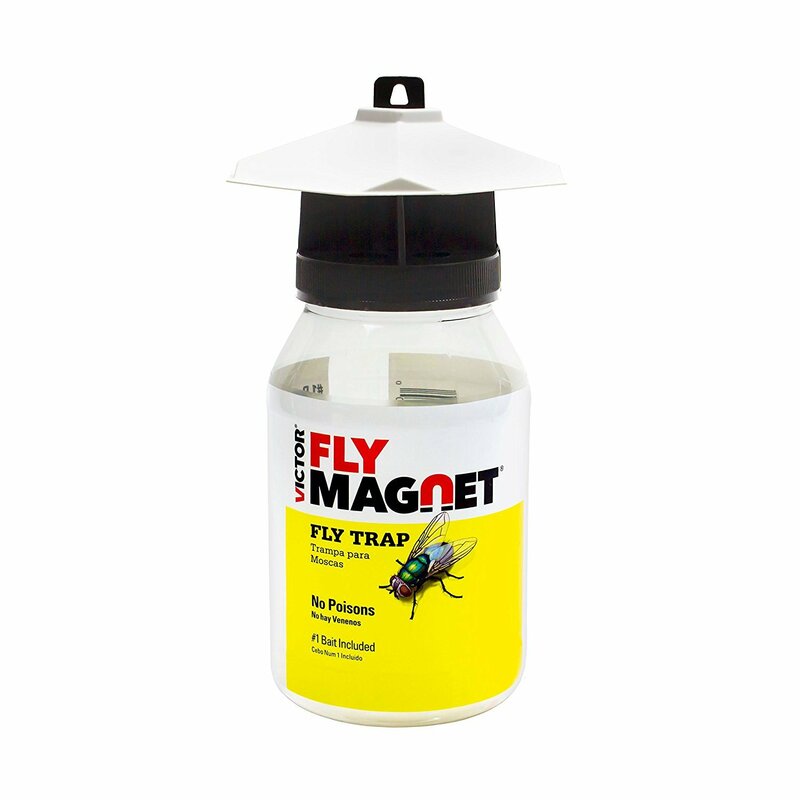 The bait when activated produces a certain odor which makes the trap worth a visit by the fly. To activate the bait, you will need to add a sufficient amount of water to it. On the body of the container is a line which marks the required water level. Besides activating the fly bait, the water makes killing the flies possible. The Victor fly trap works like any other. Apparently, some bait is needed. The product comes with the brand’s very own proprietary fly bait. The protein-rich compound when in solution form produces an odor which attracts flies to the trap. One significant attribute of this setup is how easily accessible the bait is. This is important considering the pivotal role this biological component plays in the performance of the trap. A stand out attribute of this outdoor fly trap is that the entire arrangement can be used several times without any loss of efficiency. The only exhaustible component is the bait which is readily available. Like the Rescue branded product examined earlier, this flycatcher is also harmless to the environment. It will not kill insects with substantial economic value like the honey bees and other insects which pollinate flowers since the odor scares them away. Individuals allergic to pesticides don’t have to worry as this trap poses no threat whatever besides the pathetic odor. One thing which can put you off the use of this trap is disposing of its content in your attempt to re-use the product. It might be the most disgusting sight you have ever seen. Dealing with such isn’t as easy as you would expect. 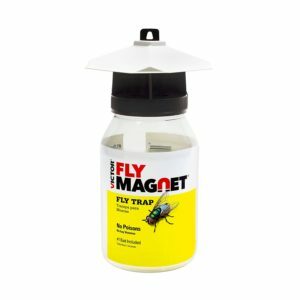 Since the fly bait works quite effectively, flies from every nook and cranny within the location of the traps will come running towards their death. This leaves the quite small container getting filled up with rather quickly. You are now left with handling the burial of the pesky flies which can be an unpleasant experience. Fly Web is an American company situated in Baltimore, United States. The firm which is a subsidiary of the AllPests conglomerate has been in the business of pest control for more than a decade. Innovative technology has remained their main approach towards eradicating the menace of pests. This fly trap is designed to be used in the home, unlike many others which are targeted at outdoor use. The product is a light bulb with a paper laced with an adhesive. While the flies are attracted to the light, they get stuck to the paper. Yes, the capacity of the glue is decent but not all the insects attracted to the light will be trapped. It is a sad reality. The size of the bulb positively affects the number of insects which gets attracted to the trap. The length of the sticky board which is long enough can be seen on the side of the bulb. It can easily be replaced if the needed arises. The problem is getting a new one is not free. You can easily purchase a pack of ten and go on to use them one at a time. While a lot of complaints have surfaced over the efficacy of the trap, many have failed to remove the protective film on the adhesive board before using it. This fly web fly trap is not limited to flies. It has been shown to catch different kinds of insects from gnats to fruit flies. And you don’t have to deal with any unpleasant odor typical of the use of pesticides. It can be used anywhere in your home where insects have been known to cause some inconvenience to the occupants. One significant letdown of this home fly trap is that it works better only at night. During the day, insects will go on with their activities in your home, and the trap would be incapable of doing anything. Why? 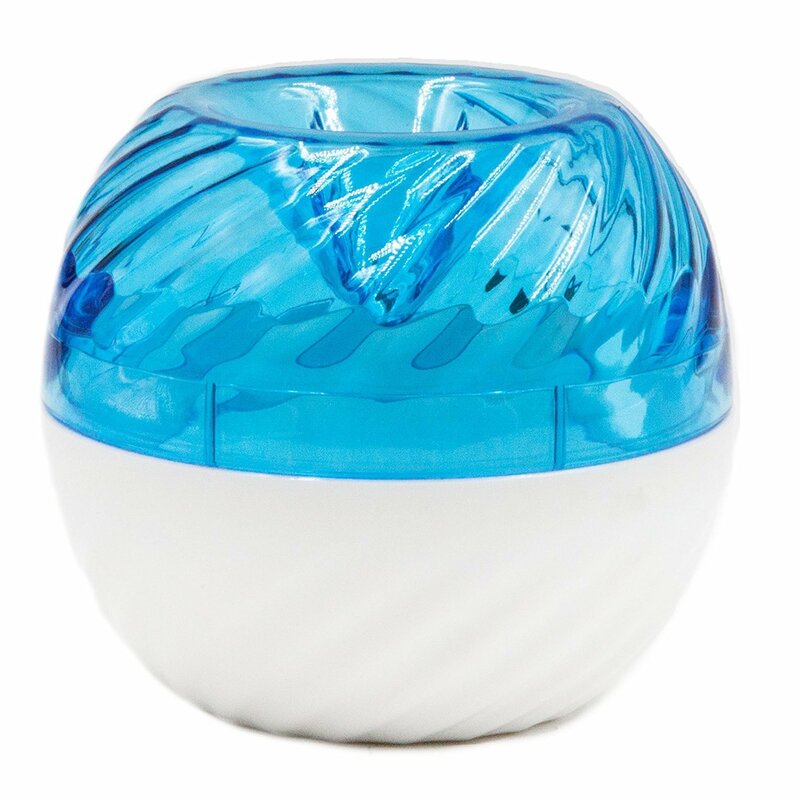 The insect light is the only thing attracting the nasty pests to the products. Under the light from the sun, these insects do not find this light bulb attractive. Another issue with this home fly trap is that the adhesive on the paper is affected by gravity and this sticky substance could with time make contact with the bulb. It could be hazardous when this happens. It is also difficult to clean out this best indoor fly trap when the need arises considering the delicate nature of the bulb. 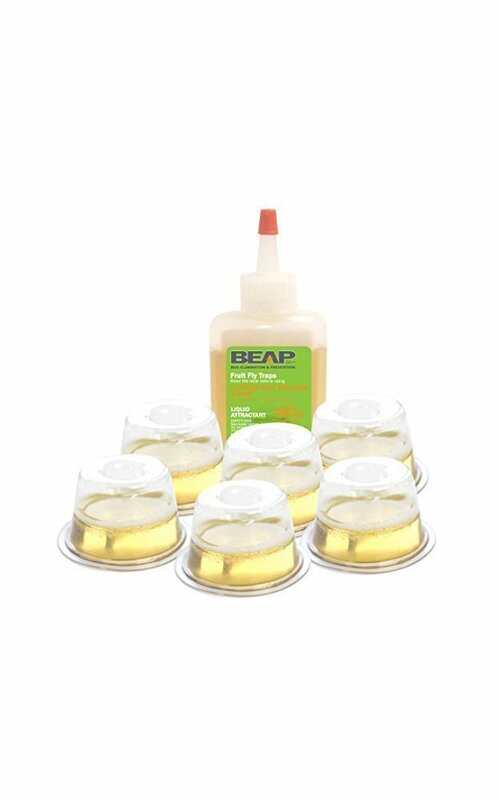 One company which has made massive gains in the fight against unwanted pests is BEAP CO. The firm which is based in Canada has put forward products which are capable of drastically reducing the number of pests currently troubling homes. Their fruit fly trap is just one of the several ways they have helped reduce the nuisance typical of this category of insects. Fruit flies are known to be attracted to edibles of different kinds especially fruits. Now BEAP CO intends to use that against this group of insects. The lure solution which serves as the bait consists of a mix of substances capable of attracting the interest of the unpleasant pests leading them to their doom. Certain small containers are provided into which the bait is added. The design of these containers ensures the insects can get in and make contact with the solution leaving the fly drowning in the fluid. Also, you don’t have to worry about the content of the plastic container spilling all over your home due to the unique nature of the solution. The liquid lasts for just about four weeks which should prove sufficient for the elimination of these unwanted flying insects. You can tell if this horse fly trap is doing the needful since the container is made of a clear material and the solution is not opaque either. In a pack of the product, 6 of the containers are provided. This means you can consistently utilize the traps for an extended period before needing to purchase another set. It is indeed a cost-effective means of cutting down on the number of fruit flies running rampage in your home. Also, you can always re-use the traps if you want. You will need to purchase the lure solution which is relatively cheap and rinsing the plastic traps is undoubtedly not an easy chore. Not only do you have to deal with the disgusting sight but the rather small opening in the container. There are several reasons why this horse fly trap has enjoyed immense patronage – it is not harmful. And you don’t have to worry about any unpleasant odor in your home. If you have pets or kids, no need to fear for their health with the use of this trap. The lack of any form of maintenance chores (unless you intend re-using it after the expiration of the solution) also makes it desirable among households with very little time for frivolities. The plastic containers can be re-used. The lure solution isn’t that effective. It can be replaced with some more powerful bait like the now popular multipurpose apple cider vinegar solution. Trapro is a pest control company with an objective of eliminating some of the most unpleasant insects troubling their clients. The firm not only makes products which can help homeowners deal with any unwanted guests (pests) but also delivers traps capable of stemming the tide of insect pests in farms and gardens. One noteworthy fact is their products are all eco-friendly which is great for the environment. At first glance, this gnat trap might not seem like much. After all, it is just a piece of thick paper hanging from a tree. But digging deeper, there are reasons why this product has performed exceedingly well. The bright yellow color of the trap has been known to appeal to aphids, gnats and a wide array of other insects. There is a very sticky adhesive on both sides of the paper. Insects get stuck to both sides fast without any possibility of escaping. This gnat trap has received wide acclaim for its catch rate which quite frankly is impressive. Like most adhesive based traps, this product initially has a film covering on both sides of the paper. This prevents the trap sticking during the setup period. Sold in packs, you can place this gnat trap around plants which are highly susceptible to an infestation from flying insects. It comes with wire cords which make tying it in place possible. Also, changes in weather conditions are not signs which could require the removal of the trap. No! This product is impervious to heavy rainfall or the harsh intensity of the sun in some regions. Certainly, this increases its value as a trap. Another feature of this product is its non-harmful nature. You never have to worry about the repercussion of getting some of the sticky substance on your skin or those of members of your household. Also, it is easy to dispose of this trap when it becomes filled up with the remains of dead insects with time. The dimensions of the yellow paper trap also increase the possibility of having insects getting stuck on its gluey surface. While the adhesive plays a pivotal role in the efficacy of this product, its size is also quite helpful. If the gnat trap were a bit smaller, the number of flying insects caught would be far lower than currently obtainable. Finally, this biting fly trap is an affordable product. Controlling the menace of pests has never been cheaper. 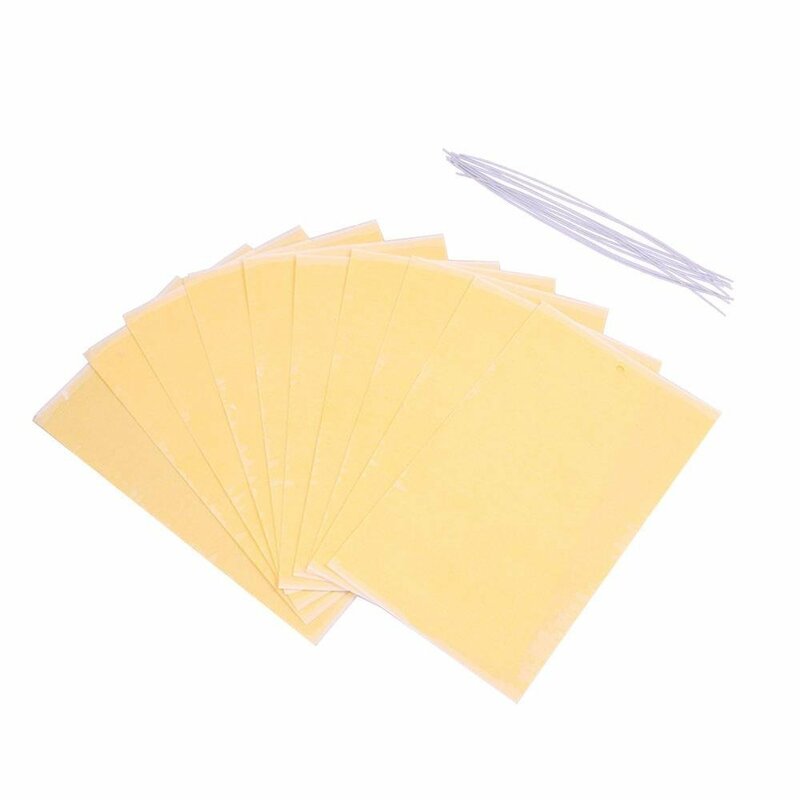 With a pack of 10 of this adhesive laced paper, you can get rid of the insects haunting your economic trees. Anyone can achieve the same result without any pressure to purchase this product. Some insects like the fungal gnats are immune to getting trapped using this method. With the scary reproductive habits of insects, controlling their population has remained a problem for many homes. Hafer is one company which has continued to introduce products to assist households in tackling the pest situation around them. Their pest control commodities are not only effective but affordable, and this endears them to a lot of families. The Hafer paper trap consists of a glue-stained paper which is capable of catching insects. To make the most of the product, you will need to have it placed in a position where insects can get to it. Usually, hanging it by the case so the adhesive surface is exposed is a common practice. Insects like flies and gnats are some of the popular victims of this trap. Many pest control products such as your regular pesticides do major damage to the environment and are harmful. Unlike these products, this Hafer trap is not only eco-friendly but is not capable of causing problems for anyone around the position where this is placed. The mechanism of operation of this best fly trap is quite simple. You hang the sticky paper trap from wherever you might be facing an annoying amount of insect infestation and just watch the unpleasant pests get stuck. There is no bait involved here which might seem surprising considering it’s supposed to be a trap. But flies and other insects do get stuck to the adhesive surface of the trap. 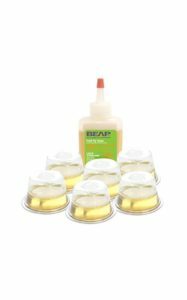 When the deer fly trap has caught a large number of insects, you can have it disposed of in your trash can without any problem. It might be a good idea to place the used trap in any unwanted container which can be sealed off to avoid the possible escape of those nasty insects. In a pack of this product, there are about twenty tubes. With such a number, you can continuously limit the number of pests disturbing the peace around your home. If you have trees where unwanted insects have been known to hold sway, this best fly trap can leave you awed when left hanging from a branch. One significant flaw of this product is its lack of adequate incentives capable of instigating the insects to get trapped. Another is your hands will often make contact with the sticky surface which is not what anyone wants. But it is a decent buy, and one which appeared to be quite affordable when compared to the misery insects put those around though. Manufacturer: Atlantic Paste and Glue Co. Inc.
Atlantic Paste and Glue Co. Inc. is a Brooklyn based firm founded by a diligent Hungarian. The American company as you might have guessed started out with the production of glue and other adhesive-based products. But their big break came with the introduction of the Catchmaster brand. 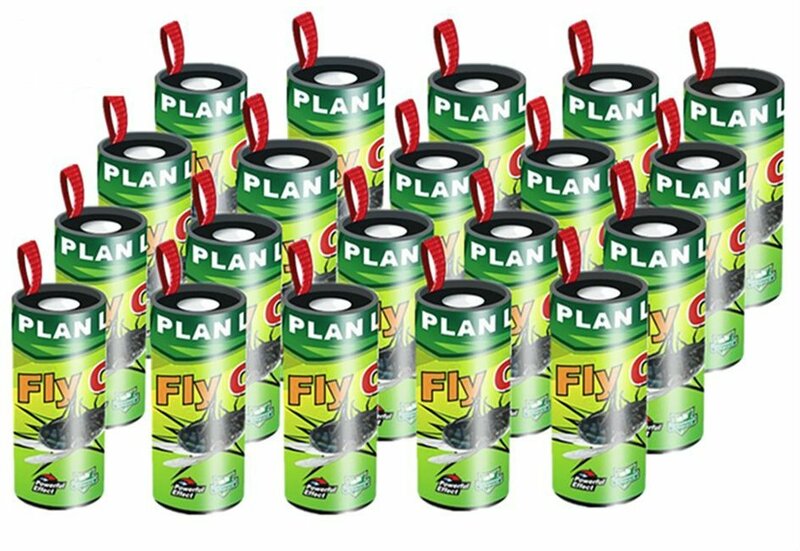 Due to the number of homes contending with flying insects, the demand for their glue based traps grew in volume. Now, clients from different countries have become dependent on the brand to solve their pest problems. 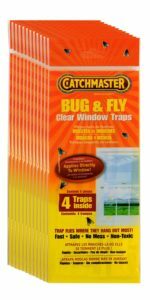 This Catchmaster window fly trap is a glue based product which uses the strong attraction flies have for windows to bring them to their end. There are two sides to this house fly trap; the surface which is less sticky is placed directly over your window sill. The side of the product with more glue is bare on your windows available for the flies to make any contact. And they do make contact which leaves them incapacitated. Before you use this house fly trap, you will need to know what window flies are notorious for visiting and then decide if you want all the traps laid out there. But be warned, this best flycatcher might be an unpleasant sight when active. So, if you entertain guests in locations where flies are known to hang around the windows, you might want to consider another approach since placing this type of trap around the window wouldn’t be a good idea. The big question remains: Does this house fly trap work? Certainly! Flies are trapped when they step on it. The adhesive substance used is of immense quality. But what do you expect from a company which began its corporate journey as an adhesive expert? They performed tremendously with this product. Since this house fly trap needs to stick to your window seal, you might be thinking it will be difficult getting it off. But it’s not. Just a little pull and this best flycatcher is off your window. The adhesive used on the side which makes contact with your window is not quite strong enough so it wouldn’t make getting rid of this indoor fly trap an arduous task. This speaks well of the design of the product and the team at Atlantic Paste and Glue Co. responsible for the creative thought. Many pest control companies are beginning to deliver products which are both harmless to those around and the environment which is the final stop for most substances. This indoor flytrap is one of the many products which have not taken the conventional pesticide approach of affecting every organism in the area where it is applied. 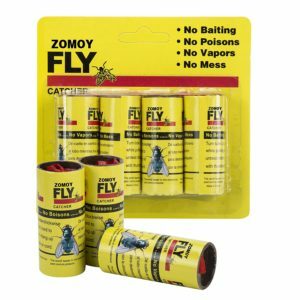 Another pest control company renowned for its efforts at delivering quality products which are cost-effective is Zomoy. One of the main reasons why this firm has remained relevant in an industry with several giants is the simple but efficient products they are known for. It takes a whole lot of dedication to do what Zomoy is doing, and they are what commending for that. 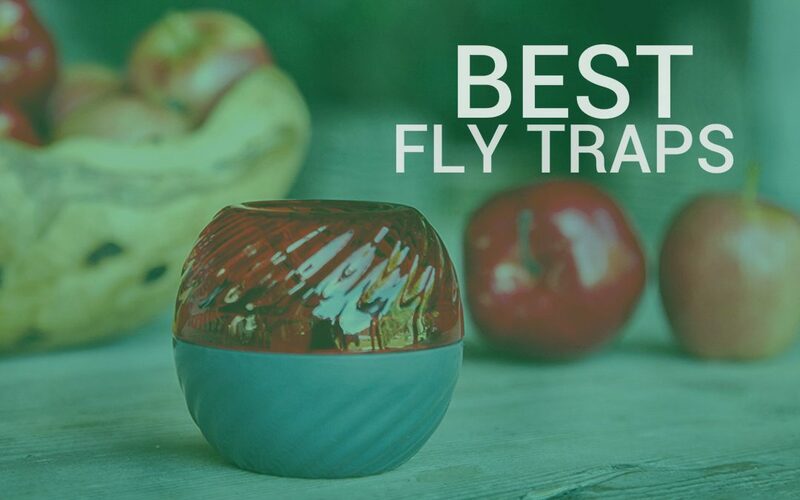 There are many fly traps in the market, so why choose this one? The Zomoy paper strip is just like any other. Just unroll it from the tube and have it hang in a place where flies and similar insects are causing problems. But it does have a distinguishing feature from the others. It has a characteristic odor which flies find very appealing. This singular attribute sets this paper strip apart from the rest. Also, those around need not worry about the smell since insects are the living things which are sensitive to it. You will need to extremely cautious when unrolling this paper strip since it gets torn easily. 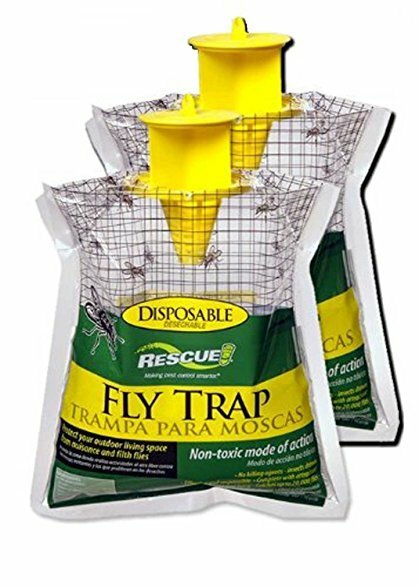 Typical of this type of traps, you have several pieces (precisely 12) which you can place around your home and garden depending on where you are facing a massive infestation from flying insects. The trap when adequately placed can have these unwanted guests struggling for their freedom. The problem with a paper strip trap is many people have found it difficult putting it to use. While it is not that complicated, Zomoy has done wonders in making it even simpler. It comes with a red cord which you pull gently until there is just enough to stick to any supporting structure. Then you unroll it in a downward manner to whatever length you desire. Another positive thing about this natural fly trap is it doesn’t use the typical bait common among other traps. Rather, an odor is used to get the flies to the paper strip. The sticky surface holds them in place until they give up or are disposed of when the trap is bulging with flies. The soft ribbon is liable to break if force is applied when putting the trap to use. It is laced with an adhesive surface with no harmful substance included. If you have kids or pets, we all know how delicate the situation can be. It is important you use products which will not endanger the lives of this category of living things. FlyFix is a company which tries to spice-up the pest control business. And it does a good job in this regard. Their products have this strong appeal to the eye though it is similar to what their rivals offer. Their ability to sell undesirable products in a manner which gets clients interested makes them stand out from an overcrowded sector. The first thing you observe when you look at this fly trap is how classy it looks. While many households are only after the efficacy of the product, a few still consider the appearance. Apparently, FlyFix intends to convert this slightly smaller group of potential customers into sales. The design of this product is one which would get even stern critics giving positive remarks about the traps. Frankly, it is aesthetically desirable. The internal decoration of your home would better off with this as your designated fly trap. Many fly traps are a bit cumbersome to use. Well, not this product. You can open the vase-shaped container and add the bait to it. This is unlike many others with only the tiny opening at the top of the plastic can for such. After adding the sweet-smelling fluid, tighten the lid over the container. When set down, flies can only get into the trap without any possibility of going out. Another feature of this best fruit fly trap which improves its appeal among homeowners is how well thought-out the design is. While rival firms don’t care about who sees the content of the trap, these guys considered how unsightly this would be to guests. So, they make the base of the trap opaque. This keeps away wondering eyes from whatever is going on within the plastic container. Most households will buy such an idea since no one wants to wash their dirty linen under public scrutiny. One common problem with this type of traps is keeping the content in the plastic can. Any spill and flies will have a field day in your home. 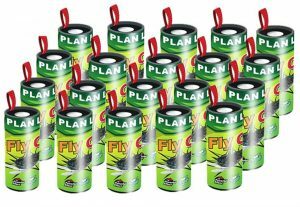 The FlyFix best fruit fly trap has been built to prevent such an accident from taking place. If the container is tightly closed, there is only one way through which the fluid can get out, and that is through the top of the plastic container. So, it is only a situation where the container is turned upside down that can cause any spills of the lure solution. Should the lure become ineffective with time, you can re-use the trap using bait capable of attracting the flies. FlyFix suggests a mixture of apple cider and vinegar. There is still that slim chance of a fly leaving through the tiny opening at the top. United Industries Corporation is the company responsible for the Black Flag brand. The American based firm is a subsidiary of Spectrum Brands Holdings. They are focused on providing products which meet the demands of a customer and are affordable as well. The Black Flag stick trap is not just another glue based trap. It takes a different path towards tackling the same problem others are dealing with. The design consists of a cylinder with a sticky body. 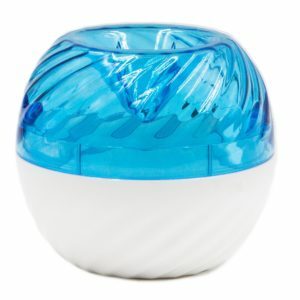 The ends of the cylinder are made of plastic, and they represent the perfect place to hold the product to avoid having some of the sticky mess on your hands. The trap comes with a plastic hook so you can place it in a part of your home where flies are seen mostly. The plan is to get these pests make contact with the sticky surface. And when they do, they can’t escape. In some cases, getting flies to make contact with the body of the cylinder could require more effort. You can smear something which has been known to attract them to the bottom of the cylinder and watch them get trapped. It might not always work, but there is a higher probability of the trap catching some insects if this is done. There are no limitations to where you can use this sticky fly trap. If your home is under rampage from flies outside, just find a place to hang this sticky trap and watch the problem go away. Same applies if flies are entering your home and showing what they are capable of doing. Disposing of used traps can be an onerous task especially when you are dealing with glue-based ones. To get rid of this sticky fly trap when it is no longer effective, you will need to get a large paper which is not being used. Wrap it around the trap. Then dump it in your household trash. The lifespan of this trap is three months which should be sufficient for it to catch some flies. The fact is there are different fly traps in the market with seemingly outrageous claims. The few considered in this review have decent attributes with a lot of positive remarks about most of them. But the best fly traps need to be cost-effective with little or no design flaws. 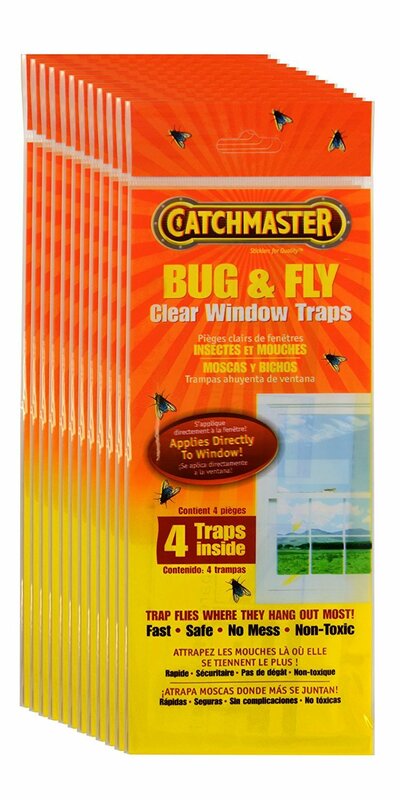 The Catchmaster window fly trap is perhaps the one which has all the desirable attributes with very few negatives.